What’s a robot to do? Is there more to life than shoveling garbage? 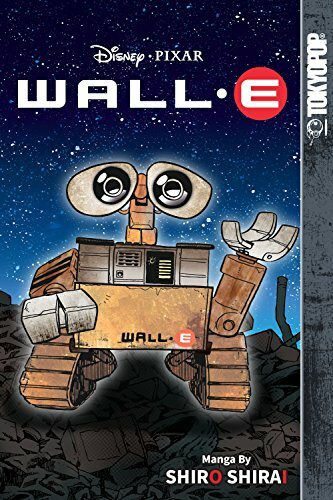 The innocence and insights that come across so well in WALL-E the movie are still here, wonderfully drawn as manga that capture the expressions and emotions of the robots (which is fantastic in itself) and the humans aboard the Axiom. The emphasis is on the robots, although more about the humans is included in the life on the Axiom section. In addition to the story, there’s a really neat info section introducing the main characters, a timeline of the world and the story, a trivia quiz, a section on life on the Axiom, and a preview of a Stitch manga. There are also sneak peeks at other Disney manga titles. I tried read this on my Fire tablet and my iPad, and I think the quality is better on the iPad, I’m sure it’s probably just the resolution of the screen. It was very readable on both. Highly recommended for anyone who loved the movie, loves manga, or simply enjoys an intelligent children’s book.